Cold brew is taking the world by storm because it often has a deeper, less acidic and more subtle taste, and is more concentrated than conventionally-brewed coffee. 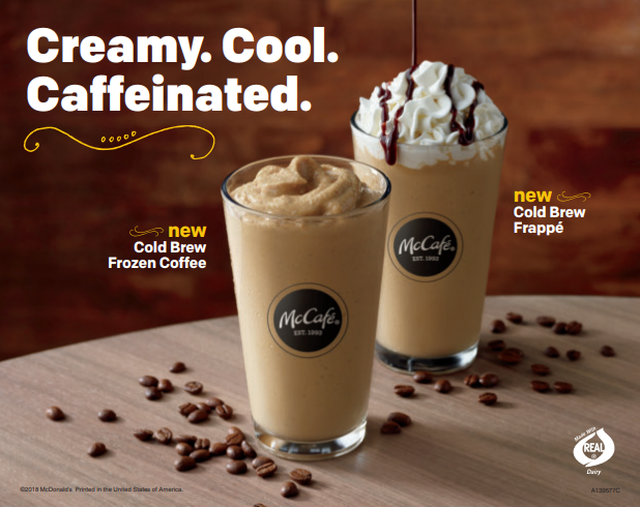 McDonald’s will be adding Cold Brew Fozen and Cold Brew Frappe to their ‘McCafe’ menu later this month. The Cold Brew Frozen (a blend of cold brew coffee, milk, sugar, and ice) is essentially the same as the Frappe version of the drink, minus the whipped cream and syrup. With summer and it’s heat right around the corner, this should be a good seller.